The Commissioners of South Mountain District are the liaisons between units and the District and Council. Commissioners lend a helping hand to all units, especially during rechartering, but are available at any time. Your unit should be contacted by a commissioner at least once a month. The South Mountain District Commissioners meeting is held on the third Wednesday of each month at 7 PM at the council office, 991 Postal Road, Allentown PA 18109-9516. 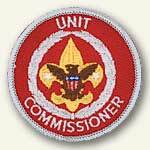 Unit Commissioners: Work towards your Commissioner Arrowhead Award (PDF). The District Commissioner and Assistant District Commissioners can also work on their Arrowhead Award. A current list of South Mountain District's Commissioner staff shows which Commissioners serve each unit, along with email addresses to contact them. Thanks to Dr. Michael J. Dolan, South Mountain's District Commissioner Emeritus, we have a brochure (PDF format) that explains what to expect from your commissioner and what the commissioner can do for you and your unit. Contact the District Commissioner via email.